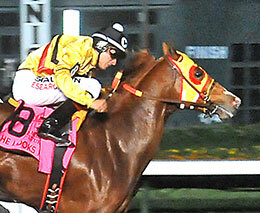 Ed Allred's He Looks Hot become on the 43rd horse to earn the title AQHA Supreme Race Horse. Q-RACING—FEBRUARY 5, 2019—All-time leading breeder and owner Dr. Edward C. Allred's homebred He Looks Hot has earned an AQHA Supreme Race Horse title. The Supreme Race Horse title recognizes a racing American Quarter Horse that during its career earns $500,000 or more, wins two or more open Grade 1 stakes races and at least 10 races. On January 20, He Looks Hot earned the final necessary step to earn the honor by winning his 10th race, his trial to the Brad McKinzie Winter Championship (G1). He Looks Hot has spent his entire career at Los Alamitos Race Course. There, the 7-year-old gelding has made 29 starts, with 10 wins and earnings of $1,202,419. He has three Grade 1 victories, including the 2015 Los Alamitos Two Million Futurity, the 2016 Vessels Maturity and the 2018 Robert L. Boniface Los Alamitos Invitational Championship. He also won the 2017 Spencer Childers California Breeders' Championship (RG1). He Looks Hot is by Walk Thru Fire and out of the Check Him Out mare Look Her Over, making him a full brother to Grade 1 winner Once Over ($453,115) and a half brother to stakes winner Take A Look (by Separatist, $179,968). He Looks Hot became the 43d horse since 2002 to earn this honor. Only 115 horses in total have earned the award; the other awards were given retroactively.